Bits and pieces of the Galaxy Victory surfaced earlier this month but, now, Sprint and Samsung have officially announced the brand new Android smartphone. It will launch on Sept. 16 for $99.99 with a new two-year contract and after a $50 mail-in rebate. 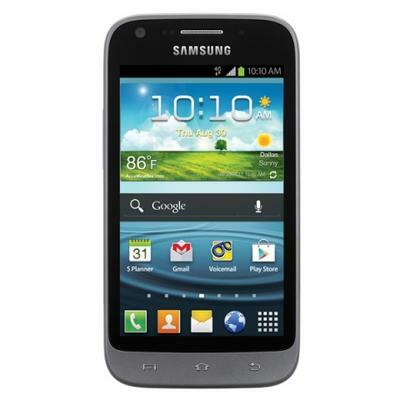 The Galaxy Victory is a mid-range Android device and comes loaded with Android 4.0 Ice Cream Sandwich, a 1.2GHz dual-core processor, a 4-inch display, a 5- megapixel camera, a 1.3-megapixel front-facing camera with video chat and support for Sprint’s 4G LTE network. Hey, it may not offer the muscle of the iPhone 5, which will also be offered by Sprint, but it’s $100 cheaper and offers a solid option for Android fans out there. OVERLAND PARK, Kan. – Sept. 13, 2012 – Sprint (NYSE:S), the only national carrier with Truly Unlimited℠ 4G LTE data, text and calling to any mobile, will offer the feature-packed Samsung Galaxy Victory™ 4G LTE at a price that makes it an easy choice for customers who are ready to step up to their first Android™-powered smartphone. At less than $100, Galaxy Victory gives Sprint customers the benefit of Sprint 4G LTE at a very accessible price. Galaxy Victory will be available beginning on Sunday, Sept. 16, for just $99.99 with a new line or eligible upgrade and two-year service agreement, after a $50 mail-in rebate via reward card1 (excludes taxes and surcharges), at Sprint Stores, Sprint Business Sales, Telesales (1-800-SPRINT1) and Web Sales (www.sprint.com). Manufactured by Samsung Telecommunications America (Samsung Mobile), the No. 1 mobile phone provider in the U.S. and the No. 1 smartphone provider worldwide2, Galaxy Victory is powered by Android 4.0, Ice Cream Sandwich, a 1.2GHz dual-core processor, 4-inch touchscreen display and access to the Sprint 4G LTE network. This allows the smartphone to effortlessly switch between applications and enables a rich web browsing experience with true multitasking. Galaxy Victory customers enjoy a Truly Unlimited experience with Sprint Everything Data plans. Sprint’s Everything Data plan with Any Mobile, AnytimeSM includes unlimited web, texting and calling to and from any mobile in America while on the Sprint Network, starting at just $79.99 per month for smartphones – a savings of $20 per month versus Verizon’s comparable plan with unlimited talk, text and 2GB web (excludes taxes and surcharges). Customers value Truly Unlimited data, because it’s simple and straightforward – no metering, no throttling and no overages, all while on the Sprint network. As a Sprint ID smartphone, Galaxy Victory provides the ability to cut through the clutter of the more than 600,000 additional apps in Google Play™. Sprint ID offers an innovative way to personalize Android smartphones with apps, widgets, wallpapers, ringtones and more and ID packs deliver a complete mobile experience – based on consumers’, students’ or businesses’ interests or favorite brands. Customers can download and switch among five self-selected ID packs tailored to an individual’s lifestyle and interests with a few simple clicks. S Beam expands on Android Beam™ to enhance device-to-device sharing through NFC technology by adding the ability to share photos, videos, documents and other DRM-free content to Android Beam. This allows a 1GB file to be shared within minutes and a 10MB file within seconds by simply touching another S Beam enabled phone. AllShare® Play allows users to wirelessly connect Galaxy Victory to their PC, tablet or television to immediately share files, stream music, user-generated videos, photos and other DRM-free content to AllShare-enabled devices using Wi-Fi®. It also allows the user to remotely access files on up to six Samsung devices. Continuing its aggressive momentum in delivering an all new 3G and 4G LTE network experience for customers, Sprint announced on Monday that 4G LTE construction has begun in more than 100 more cities within its existing nationwide 3G footprint. Major metropolitan areas in which Sprint 4G LTE is expected to be available in the coming months include Boston; Charlotte, N.C.; Chicago; Indianapolis; Los Angeles; Memphis, Tenn.; Miami; Nashville, Tenn.; New Orleans; New York; Philadelphia; and Washington, D.C.
During the pre-launch phase, customers with 4G LTE devices may begin to see 4G LTE coverage in these areas and are welcome to use the network even before it officially launches. Sprint plans to announce commercial availability of 4G LTE in these cities in the coming months, at which point we expect coverage, performance and reliability to get even better. The markets will fill in until coverage largely matches the existing nationwide 3G footprint. Sprint 4G LTE is now available in 19 cities, including Atlanta, Baltimore, Dallas, Houston, Kansas City and San Antonio. Sprint’s Network Vision project also includes significant improvement in customers’ 3G network experience, including expanded coverage, improved network reliability, better voice quality, and faster 3G data speeds. For the most up-to-date details on Sprint’s 4G LTE rollout, visit www.sprint.com/4GLTE. Sprint will host the 12th annual Open Solutions Conference on Oct. 24-25 at the San Jose, Calif., Convention Center offering developers, ecosystem partners and executive attendees an up-close view into the latest app developing tools and capabilities, keynote presentations from Sprint CEO Dan Hesse and other industry leaders, breakout sessions, coding sessions, event sponsor exhibits, and business-critical networking opportunities. Registration is open at http://developer.sprint.com/OSC2012.